Applaws Natural Complete Senior Dog All Breeds Chicken is a totally natural dog food made with 75% meat and 25% vegetables. 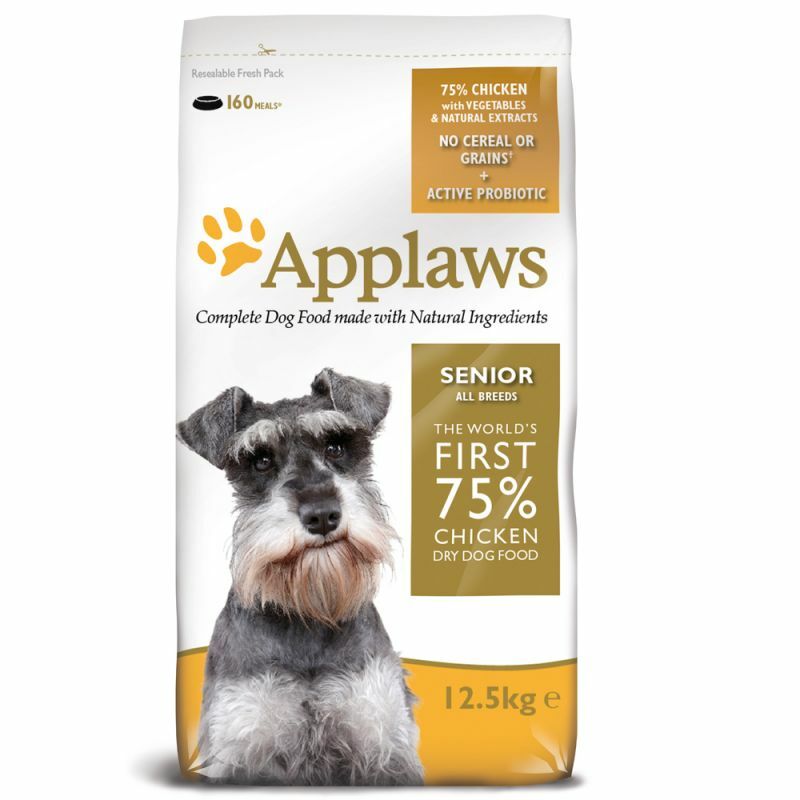 Applaws Natural Complete dog food also contains an active Pro-biotic to promote a healthy digestive system.Applaws Natural Complete Senior is specially formulated for mature canines, helping to combat ageing and encouraging mobility in later life. This healthy and wholesome food contains absolutely no cereals or additives. Most importantly, this dog food boasts a delicious taste your dog will love! Chicken 65% (from Dried Chicken), Chicken Mince 9%, Peas 8%, Potato Starch 7% Beet Pulp, Poultry Oil 1.5% (Source of Omega 6 ), Tomato (from Dehydrated Tomato), Poultry Gravy, Whole Egg (from Dehydrated Egg), Cellulose Plant Fibre, Minerals, Vitamins, Salmon Oil (source of omega 3), Coconut Oil (source of natural MCT’s) Carrot (from Dehydrated Carrot), Chicory Extract (F.O.S), Alfalfa Meal, Seaweed/Kelp, Glucosamine, Methylsulfonylmethane, Chondroitin, Carrot, Peppermint, Paprika Meal, Turmeric, Thyme Extract, Citrus Extract, Taurine 1000 mg/kg, Yucca Extract, Cranberry, Fennel Extract, Carob Extract, Ginger, Rosehip Extract, Dandelion Extract, Rosemary Oil Extract, Oregano, Probiotic: Contains E1705 Enterococcus faecium cernelle 68 (SF68: NCIMB 10415) 1,000,000 cfu/kg as an aid in the establishment, maintenance and restoration of a balanced gut flora in dogs. Protein 37%, Crude Oils and Fats 16%, Crude Fibres 5.25%, Inorganic Matter 8%, Calcium 1.34%, Phosphorous 1.32%, Carbohydrates <25.8%. Below are some recent questions we've received regarding Applaws Senior All Breeds Chicken Dog Food, including answers from our team. I am currently changing my 14 year old dog from a k/d diet as his kidneys are now stable. My vet has advised that I can now put him on a high quality senior food. My dog does have some liver problems (he has an enlarged gallbladder) and is currently taking 300mg of destolit a day. He has also lost weight over some months and has some muscle wastage in his legs. I was tempted by applaws for him because of it's digestible protein which I thought may help with building/maintaining his muscle strength. I have also read that good quality protein does not necessarily put strain on the kidneys or liver. However, is it too big a jump from the protein levels in the Hills k/d to the 37% protein found in the applaws? I am worried that perhaps it is too big a change for him and wondered if I should aim at a protein level of around 25% and was also thinking of grain free wainwrights or barking heads. Any advice would be so welcomed! Thank you. I am in fact a fan of grain-free diets for dogs. However they are usually much higher in protein and despite everything else, in my opinion a lower protein diet would be better for your particuolar dog. I would suggest one of the senior diets from Hills or Royal Canin, which I expect is what your vet was intending too. Those other diets are not really applicable to your dog and the jump in protein levels might well cause a lot of trouble.